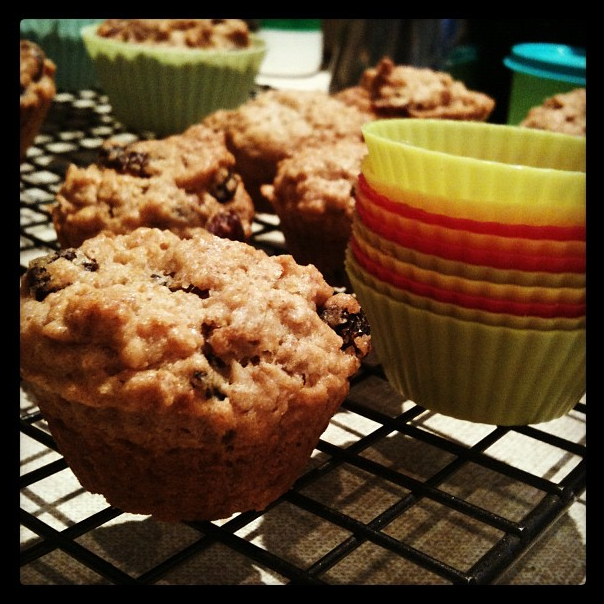 I’m always on the lookout for muffin recipes that are more nutritious but still yummy, reasonably simple, with ingredients already in the pantry. I adapted this recipe I got from my sister a number of years ago to suit our family’s allergies. Silicone patty pans make life so much easier – no sticking and a lot less clean up! Equivalent of 2 eggs worth of No Egg plus 2 tbsp extra water than the recommendation – although I’d add the extra once everything is in only if you think you need to. Combine all the ingredients and put into muffin pan. You’ll find it still a thick mixture but just work quickly so that the weetbix don’t steal all the moisture! Cook at 180degrees for approximately 15-20min or until cooked (obviously!). These muffins are quite delicious, especially the surprising little crunch you get from the Weet-bix bits. Next > Overnight Oats – breakfast heaven! !